September 22 was National White Chocolate Day. Naturally, I missed it. If I’d been on top my National Food Holidays, I would have recommended this recipe for White Chocolate Challah Bread Pudding. It’s one of favorites, and I don’t particularly love white chocolate or bread pudding. The challah and the custard make this taste more like a tres leches cake than a typical bread pudding. This is from The Figs Table. Adapted from The Figs Table, White Chocolate Challah Pudding is my favorite bread pudding recipe of all time. Preheat the oven to 350 degrees F. Grease an 8 inch square pan, and have ready a larger pan (such as a roasting pan) as you will be baking the smaller pan in the larger. Whisk the egg yolks and eggs together in a small bowl and set aside. In a large saucepan, combine the cream, milk and sugar and cook over medium heat until bubbles begin to form around the edge, but not quite boiling. Stir in the white chocolate, then gradually add the egg mixture in a slow and steady stream, whisking constantly. Remove from heat and stir in the vanilla extract (or paste). Put the bread in the greased baking pan and pour the egg mixture over the bread, pressing it down and making sure it all falls through the cracks. Let rest for 15 minutes. Cover with aluminum foil and place in a larger pan (such as a roasting pan) filled halfway with very hot water. Transfer to the oven and bake until firm and, when touched in the middle, the custard does not show up on your finger, about 1 hour and 15 minutes. As the custard bakes, keep checking the water level, adding enough so that it’s always at the half way point. Serve warm with fresh berries or raspberry sauce. Sauce: Place thawed raspberries and sugar in a saucepan. In a separate bowl, stir together water and cornstarch. Pour over raspberries and set over medium heat. Stir mixture until it beings to boil, thicken and clear. Remove from heat. Place a sieve over a bowl and pour berry sauce through sieve, pressing so that the sauce goes into the bowl and the seeds stay behind. Stir lemon juice intro strained raspberry sauce. If you have some raspberry liqueur, add it - this is a great addition, but not necessary. The main issue was there was a little too much liquid for my standard 8 inch square metal pan. By carefully pressing down the bread and pouring the cream mixture on slowly, I was able to get all but about ¾ cup in. I don't recommend scaling this recipe at all because in this case, you really do need a lot of the cream mixture to get the proper result and it's better to have too much than not enough. Just pour the mixture carefully and let the bread kind of soak it up. It should come up almost to the top of the pan, at which point you'll be putting the foil on it. I used Baker's White Chocolate Squares. If you feel like spending more, you can try it with something more expensive. However, I'd stick with Baker's. I'm just not so sure using anything more expensive would be worth it since you are just melting it all into a dessert. I don't think I'd use white chips, though. 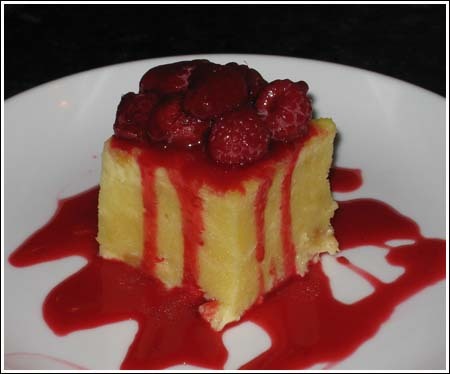 I served it with raspberry sauce and a few whole raspberries and my husband said the raspberries "made the dish". While a caramel sauce would be good too, the raspberries cut the richness a bit. Since this dish is pretty rich, you might consider cutting pieces a bit smaller. I actually got about 12 servings rather than 6. Then again, who am I to tell you how big your dessert should be! Have FUN in San Francisco, Anna. Your blog looks terrific as does this bread pudding!!! This question has nothing to do with this post, but I came across a place called Hey Cupcake! in Austin and I was wondering if you knew anything about it. I hope you are having fun in SF! This looks like a bread pudding I would like! The bread pudding looks yummy and much better than what I’d pictures. I don’t really care for bread pudding either. Have a WONDERFUL time in SF! !